Tomato- A fruit or a vegetable? Scientifically speaking, a tomato is a fruit, but as far as it’s cooking is concerned it is called a vegetable as used in savoury dishes rather than a sweet one . 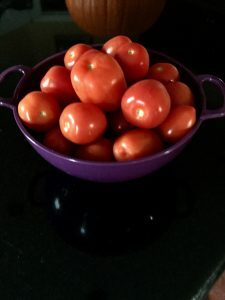 Here are some beautiful tomatoes from my garden. Last of the batch. If you don’t love tomatoes, you will after reading all the benefits you can get from eating them. Lycopene, a pigment responsible for the red color of tomatoes is an amazing phytonutrient.It has antioxidant properties and protects the body from toxins. It is a great cancer -fighting food. Studies have shown lycopene can slow the growth of breast, prostate, rental cell carcinoma and uterine cancer. Lycopene protects the eyes from oxidative stress, making it one of the stronger eye vitamins you can consume. It has pain-inhibiting abilities for those suffering from neuropathy . Helps lower blood pressure . Great neurological benefits have been found like delaying onset and progression of Alzheimer’s disease by protecting healthy cells. In people who already have this condition it can counteract future cell damage. Here are some facts to know about lycopene. It is a fat soluble nutrient, meaning it is absorbed better when consumed with healthy fats like avocados and olive oil or seeds. So go ahead and make some pasta sauce by adding some heat and healthy fats to tomatoes and get your dose of lycopene in. 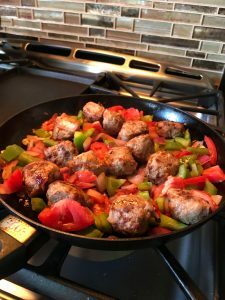 I just added them to some organic chicken meatballs onions and peppers and it was delicious.